Digital disruption is inevitable, especially as new technology emerges at a rapid pace. But instead of being disrupted, it’s up to companies and leaders to take charge and become the disrupters themselves. 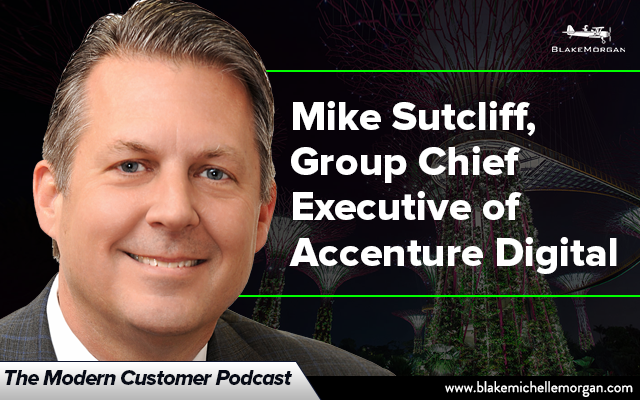 According to Michael Sutcliff, Group Chief Executive of Accenture Digital, the future of customer experience is all digital and focuses on personalization. However, creating a plan on a whiteboard and actually putting into into action at scale in the real world are two very different things. In order for a digital strategy to truly be effective, companies must be able to adapt their digital technologies and learn more about their customers’ intentions over time. Preparing to be disrupted isn’t something that happens overnight — companies must work at it and plan to adapt their strategy. Many of the companies that struggle with digital disruption are those that don’t want to put the work in or don’t know where to start to move towards the digital space. Some companies put lots of effort into the front end of customer experience without realizing the changes that need to be put into the back end and the supply side. Creating a strong digital customer experience is both an art and a science that requires work and planning on all sides. Instead of relying on legacy technologies like outdated call centers, many organizations don’t realize the importance and potential of a digital customer model that can be much more efficient and interactive. In the digital space, disruption can come from any other industry, not just those that are right around your company. Consider the example of Airbnb: it paid attention to customers to realize what they really want is an experience. The company then partnered with other brands, such as transportation or ticketing companies, to take advantage of their technology and create a package for Airbnb customers that gives them everything they need for a great experience. Airbnb wasn’t disrupted by other industries but was able to leverage their technology to disrupt Airbnb’s current model and create something more efficient and successful. But no matter how much technology is added, customer experience will always be human centered. Technology is simply the supporting tool to create a good experience for a human, whether that is the customer or an employee. The best digital strategy can’t create a strong experience if the human skills and connections aren’t there. Companies should work to truly understand customer intentions instead of just caring about how much money each customer earns for the company. Customers can quickly see when a brand doesn’t truly care about or understand them. New digital technologies provide companies the opportunity to greatly improve their customer understanding and interactions — companies that don’t keep up or lead the pack of disruption will quickly fall behind companies that are embracing disruption. Digital disruption has the potential to fundamentally change how an organization does business and interacts with customers — but it’s up to the company to take charge and lead the change.